CHI 2016 Housing is open! Make your housing reservation now! You can also register at CHI 2016 Conference here. The deadline for reservations is 5:00 PM Pacific Time on Thursday, April 7, 2016. Requests received after this date will be accepted based on availability. Rates after this date are not guaranteed. Why Book at the CHI 2016 Hotels? In order to obtain the special conference rate attendees must make hotel reservations through the official housing bureau for CHI 2016. This site offers one-stop reservations for CHI attendees and accepts reservations online or by phone. Utilizing the housing bureau also allows us to keep our conference costs low and continue to offer room blocks for our attendees. Plus, all official CHI 2016 hotels offer complimentary internet in your guest room. Attendees booking through any other mechanism will not receive complimentary internet. ACM and CHI work hard to make sure that the conference rate is competitive, and monitor the hotel’s other rates to make sure that our attendees are receiving the best deal. Your stay helps SIGCHI meet our obligation to the hotel, allowing us to keep registration rates low. Without your hotel stay, ACM may be assessed a financial penalty which would jeopardize our ability to provide quality conference opportunities in the future. 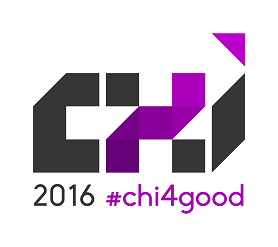 Official CHI 2016 hotels will not accept reservations directly. Reservations must be made through the CHI housing bureau. Please note that a credit card is required to reserve your a hotel room on the housing site. If wish to pay by check deposit, please contact our housing coordinator, Karla Gutierrez (kgutierrez@teamsanjose.org). If you require multiple rooms, you may fill out a group block request. If you require additional assistance with your reservation, please contact the CHI Housing Bureau. 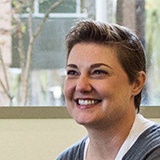 Live help is available Monday – Friday from 8:00 am – 4:00 pm PST. See a map of the hotel locations. NEW lobby and guest rooms! Stay well-connected to comfort and convenience at San Jose Marriott. Adjacent to McEnery Convention Center and near downtown, SAP Center and Norman Y Mineta San Jose International Airport (SJC), our hotel is perfect for business and leisure travelers as well as parents and alumni visiting San Jose State University. Well-appointed guest rooms and suites feature premium pillow-top mattresses and the fastest Wi-Fi in the region. Our San Jose hotel boasts a celebrated dining experience at Michael Mina’s Arcadia along with handcrafted cocktails at Tanq Bar. When it comes to being productive, professionals will appreciate our 21,000 square feet of meeting space with the latest technologies for flawless presentations. Downtime can be just as fruitful when taking in great views of the city while lounging at the heated rooftop pool or working up a sweat at the state-of-the-art fitness center. Complimentary Internet in guest rooms for CHI attendees. Connected to the San Jose McEnery Convention Center and situated at the hub of a city flourishing with industry, our Hilton San Jose hotel is an ideal choice for business travelers. Relax at our outdoor patio or refresh with a dip in our heated outdoor pool. 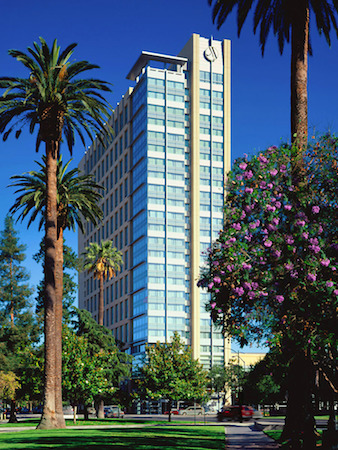 With modern rooms and suites, a European-inspired restaurant, 24-hour fitness center and pool and extensive event space, the hotel offers all you need for a memorable trip to San Jose. Complimentary Internet in guest rooms for CHI attendees. 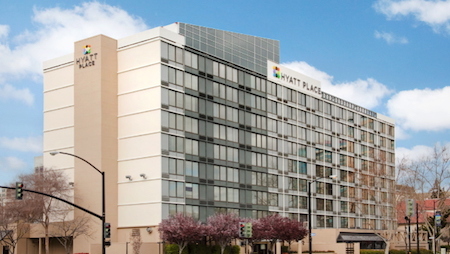 Hyatt Place San Jose/Downtown hotel is in the perfect Northern California spot, close to San Jose’s most popular tourist destinations, top corporations and major sporting and event venues. Our close proximity to the Mineta San Jose International Airport makes it easy for our guests to get to and from our hotel. 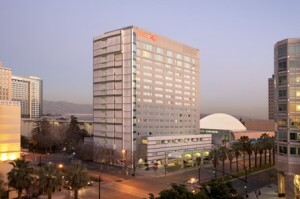 Our convenient location also gives you easy access to all major freeways, the train station and the light rail, putting business and leisure travelers right where they need to be to attend business conferences or just to explore San Jose. Complimentary Internet in guest rooms and complimentary breakfast for CHI attendees. 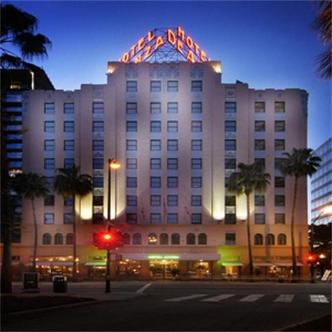 Named after famed explorer Juan Bautista de Anza, the iconic Hotel De Anza is situated in the heart of San Jose’s central business district. 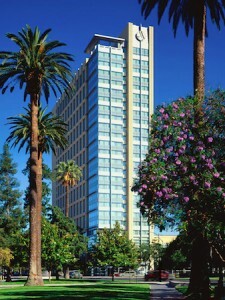 Hotel De Anza is located just a short 10 minute walk or 7 minute Light Rail ride from the San Jose Convention Center. Significant for its architectural style, it is one of San Jose’s few “Zigzag Moderne” Art Deco buildings. Complimentary Wireless Internet access is available throughout the luxury San Jose hotel. 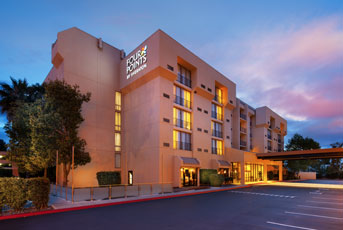 Four Points by Sheraton San Jose Airport is located minutes from the Mineta San Jose International Airport (SJC) with free shuttle service to and from the airport. With the Gish Light Rail stop located conveniently by the Four Points San Jose Airport Hotel, take a short, 25 minute Light Rail ride to the San Jose Convention Center and the major tech companies in Silicon Valley. Stay connected while you’re on the road with home and the office with free High Speed Internet Access and a complimentary welcome amenity for all CHI attendees. All CHI 2016 hotels are fully accessible. The Hilton and Marriott are directly connected to the conference center, which may simplify matters for attendees concerned about minimizing travel distance.